Hypertufa troughs and planters: they look great, plants love them, and you can make your own at home. 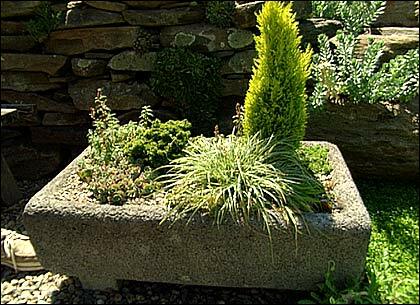 The principle behind these versatile, easy-to-make faux-stone planters is that their composition of mixed sand, peat moss and cement facilitate excellent drainage, which allows you to grow plants that otherwise probably wouldn't make it in the ground, such as certain herbs, alpine plants, dwarf evergreens and others. The planters' sturdy antique look will add interest to your garden on their own as well! Many thanks to Helen Phillips at Callaway Gardens in Pine Mountain, Georgia, for the planter "recipe" that follows. 1. Mix the sand and peat moss thoroughly. Then, wearing a mask so as not to inhale cement dust, add the cement to the mixture and mix it again. 2. Slowly add water  it's important to add it a little at a time, mixing it in well with each addition. This will help avoid over-saturation. Add just enough to achieve a stiff consistency. 3. Wearing gloves, apply the mixture to the bottom of the mold and press firmly. The base should be about 2 inches thick. Then apply the mixture to the sides of the mold. The sides should be about 1 inch thick. 4. To make drainage holes, firmly insert the two dowels into the base of the mold, screwing them in until they reach the bottom. Leave the dowels in the mold and cover the entire planter with plastic (grocery store plastic bags work well). Let the planter dry for 24 hours. 5. To unmold the planter, remove the dowels and turn the mold over. The planter should slide out easily. Clear out the drainage holes and smooth the edges of the planter to your liking with a wire brush. 6. Finally, cover the planter again with plastic and place it in a shady spot for one month. Before using, flush it well with water. So there you have it  a very attractive "old" planter that looks like stone, perfect for alpine plants, small evergreens and more. And best of all, it's handmade! This segment appears in show #2717.